French apple tartlets or mini apple tarts are best fall desserts. The base is thin and flaky shortcrust pastry with warming spiced apple filling. The whole house will smell amazing and you will feel the taste of fall in every bite! For shortcrust pastry combine sieved flour with other dry ingredients. Add cold butter, cut into cubes and start rubbing with your fingers until crumbs come together. Start adding a teaspoon of cold water until you can form it in a ball. Divide the dough into 2 pieces. Form the crusts in ramekins and place them in the fridge. Preheat the oven to 355 F / 180 C.
Make apple tart filling. Cut apples and place them in a pot with water, sugar and spices. Let it come to a boil, simmer 10 minutes until apples are soft. Smash apples with a back of wooden spoon, leaving some apple pieces. Let it cool. Prick the crusts with fork or place parchment paper with baking beans on top. Bake crusts 10 minutes until golden. Meanwhile cut apple into slices as thinly as you can, using mandolin or sharp knife. Fill baked empty shells with apple jam and place around apple slices, overlapping one on the other. Brush the top of apples with apricot jam, add apricot pieces in the center of the tartlets. 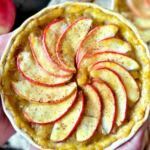 Bake French apple tartlets 10-15 minutes more. Brush baked apple tartlets with more apricot jam. Sprinkle some cinnamon or icing sugar on top of baked apple tartlets. Enjoy warm or cold, with some ice cream, whipped cream or yogurt. These French apple tartlets are baked in two 5,7 inch / 14,5 cm round dishes.